They are having a challenge to make Moos so I figured what the heck I needed a break from the cards I was working on and the challenge of a smaller canvas sounding intriguing. I made 2 Moo's using some ISC stamps. The first you see above was made using some butterfly wings from Summer Elements II stamped in Noir Palette Ink onto white paper. 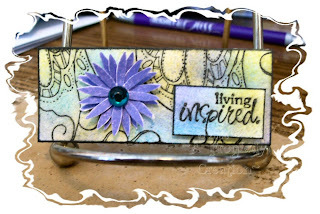 I then grabbed my stipple brushes and more Palette Inks in Iris, Sunflower and Cote d'Azure. I stippled them onto the white card stock and ended up with a bit of green in there from mixing the colors too :) I liked that effect. I then stamped a flower from the same Summer Elements II set 3 times in Iris ink on white card stock, I cut them out and layered them, tipping the petals up so give it some depth. 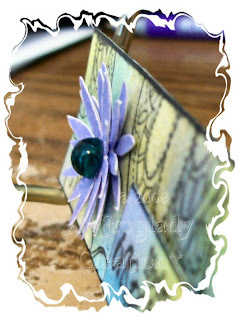 The center is one of the acrylic cabochons that I have been using lately. After doing it all up I thought it needed something on the one side still so I grabbed my It's the Little Things set from TAC (TA-2876) and stamped it onto white card stock, repeated the stippling and then mounted it on my super sticky black foam dots from Jody's sale. For the second one I again used a part of the butterfly wings to do the background and then again stippling with the same colors. Check out how different the backgrounds are though as this one I put more Iris on. I wasn't quite sure what to do with this one so I grabbed another sentiment from the It's the Little Things set and stamped it on white, stippled and used more of the black super sticky foam dots to mount it. Then I dug around in my embellies box and found this butterfly charm , I cut the circle piece off the top with my snippers and used a super sticky glue dot to adhere it to the background. These were fun to do - not sure they are going to become a MUST DO or MUST HAVE for me but they will make cute magnets as she says on her blog. Maybe good for little gifties too! So scoot over there and check out the blog where she features hers and some friends but then she links to her Creative Architects Blogs for even more eye candy! It is worth the time just for the eye candy...not to mention there is blog candy involved too! Let me know what you think. I did one more set but I am not sure they are done yet so I will have to think and look on them some more before sharing. Hi, Karyn, I'm in your s-corner yahoo group, saw your blog link and came by. Love your landscape moos. It's given me an inspired idea for a series of them -- now if I can just actually translate to action, lol. Anyway, thanks for the inspiration and sharing your lovely cards. I really like your moos - I think it is a unique size to create on - I had never seen or heard of moos before!